Utilizing the FlightPath maneuver system, command your army in epic aerial and ground combat & customize your army with spells, equipment, weapons, special abilities and more!
. . . were the words uttered from my 11 year old daughter when I asked her what kind of game she wanted to play. She loves dragons, so I was on a quest to find a game. I found this game! Not only did it meet the criteria of my daughter, it met my criteria as well. This is a very strategic and tactical game with beautiful miniatures. The tactics and upgrade cards can get very complex and there are lots of cards and tokens to this game but don’t get overwhelmed by that. You can choose to not use all the “extras” in the game and just play a simple move and attack game that will take about 10 minutes. Once you learn the basics, you can keep adding upgrades as you feel comfortable. When I play with my kids, they pick a dragon and that dragon’s breath weapon card and that’s it. To really speed the game up, we won’t even use the shield ability on the dragons. There are other rules we overlook too. But that doesn’t matter much to us. My daughters just love flying the dragons around and saying they are wacking the other dragon with their tails or breathing fire on the other dragon. In more competitive games, I’ll use all the features and upgrades to the game. That is the part I really enjoy. I like building up my forces and building up my dragon’s powers by adding upgrade and spell cards. One of the downsides to this game is that it will hit your pocketbook. This is a collector’s game for sure. You have to buy each individual unit separately, except for the initial starter box which contains 3 dragons. Some of the smaller units cost around $10, while some of the most expensive will cost over $60. On average I’d say expect to pay between $20 and $30 for each unit or dragon you buy. Overall, this game is very versatile in it’s complexity and matchup ability. You can play simple 10 minute games or very complex campaign game that last for hours. You can play 1 on 1, 1 on many, or teams. This game is enjoyable for every level of gamer. You can get many hours of enjoyment out of this game even if you just buy the starter box. 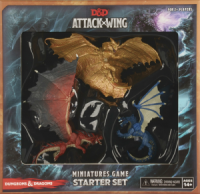 Add a Review for "Dungeons & Dragons Attack Wing"